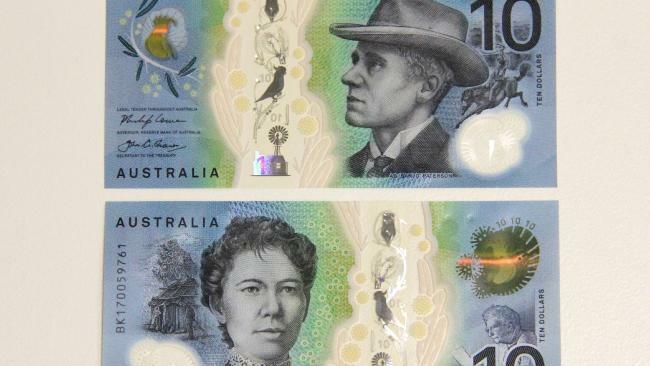 Australia's $100 notes: where did they all go? YOU probably know the story by now - Australia is absolutely flush with cash, especially hundred dollar bills. There's more of them out there than ever before. The Reserve Bank of Australia keeps printing it and printing it. And it is scarcely seen again. 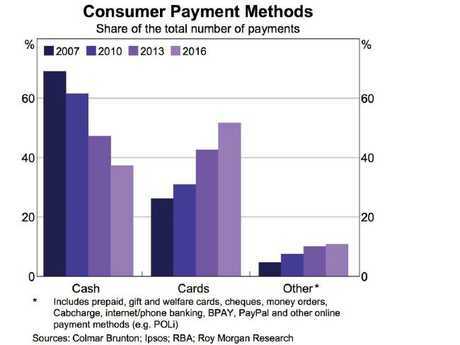 While the previous graph shows the amount of Australian cash in existence, the next one shows the share of transactions where cash is used. This is the heart of the paradox: They're going in different directions. 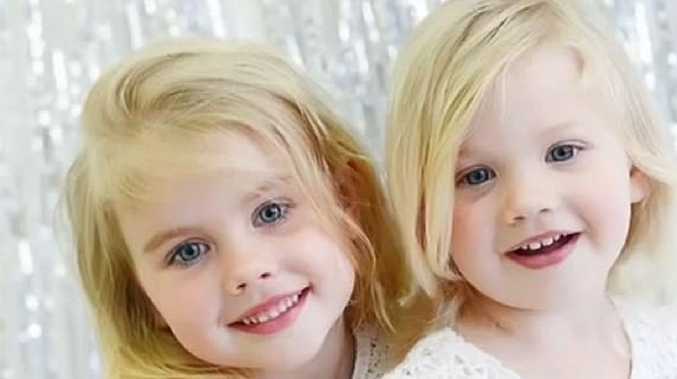 RBA detectives have been on the case to figure out what the heck has been happening. They've finally got some good answers and it was under their noses all along ... Because we use it less, cash changes hands less often. 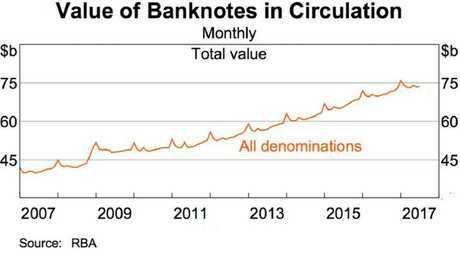 Each banknote is involved in fewer transactions per month, so we need more banknotes to do the same amount of cash transactions. The average number of times that each banknote is used to make a payment in a given period of time is called the velocity of cash," the RBA said in a report released this week. "The velocity of cash is not constant." If you've ever gone to the ATM and found you still have a bunch of crisp fifties in your wallet three weeks later, you're helping slow the velocity. Money is not burning a hole in our pockets any more so much as rotting away in there. Meanwhile the shop assistant asks "tap?" and we wave our card at the machine and put it back in our pocket before it even says "Approved". It's not just wallets where cash is quietly sitting not doing much. ATMs still get stocked even though we visit them once in a blue moon. I would have guessed banks were stocking ATMs with less money since they're not being drained as often, but the RBA says nope. "It is logistically challenging and costly to restock ATMs frequently, so they typically hold several days' worth of withdrawals," the RBA said. The bank also reports the downside of keeping cash in ATMs is less because interest rates are so low. The money wouldn't be making much return if it was put to work instead of just sitting there. The weirdest and most interesting explanation in the RBA report is self-service check-outs. Unlike a standard checkout operated by a person they usually keep separate internal sections for money received and money that can be given as change. That means they don't turn money over like a normal checkout. Instead they have to be stocked with lots of change and take in lots of money, gumming up the velocity of cash. Australia has at least 17,000 self-service check-outs, the RBA said, and I reckon there would be more being added each day. Ticket machines and vending machines often take banknotes these days and that probably further explains where some cash is hiding. While cash is sluggish in the legal economy, it is still zooming round in the illicit economy. If you're on Gumtree trying to sell "party supplies" it's highly unlikely you're accepting credit cards for your goods. You take cash and use it to pay suppliers, etc. You are also likely to avoid banking it, so it piles up. The Reserve Bank boffins have very limited ability to find out how common this, but they do have one trick up their sleeves. So cash is not dead and that is probably good news for the RBA, which is introducing a whole new set of banknotes. The new ten dollar bill is being rolled out at this very moment. Whether we actually spend them or not, it seems like we will get a lot of opportunities to hold them for years to come.